Australia were given a wakeup call as they were nearly stunned by a late attempt of a comeback by Sri Lanka in the first final of the Commonwealth Bank series at Brisbane. Australia, who looked to be cruising to victory, took their foot off the gas, allowing the Sri Lanka to grab and maintain some momentum as their lower order batsmen hammered the Australian bowlers all over the ground. Australia, who won the toss, elected to bat first on a pitch that looked to be a batsman’s paradise. Openers David Warner and Matthew Wade took full advantage of the pitch and the Sri Lankan bowlers, whom they dispatched for runs to all parts of the stadium. Together, with some excellent communication and classy batting, Warner and Wade put together an astounding and rapid first wicket partnership of 136 runs, with both Wade and Warner reaching their half centuries. The partnership was finally broken when Wade was dismissed, thanks to an absolutely cracking catch, which initially looked to be sailing over the ropes for a six, on the long on boundary by Rangana Herath. The crowds looked on in quiet awe, before the Sri Lankan fans went berserk upon realising what had just happened. Warner did not let the wicket of his opening partner slow him, down as he continued his blitz against the Sri Lankan bowlers, this time along with Shane Watson, who settled in well, but did not last long, as he was caught out on 21, but, the two did manage to complete another 50 run partnership. However, after the wicket of Watson, Sri Lanka kept the pressure up and were rewarded with more middle order wickets, most important being the wicket of David Hussey, who has been batting brilliantly throughout the series, as he fell after scoring just one run. Warner, still going strong at the other end, watched his partners depart one after another and decided to ramp up the scoring rate, after it dropped significantly during the regular fall of wickets. Warner put his plan into action when Captain Clarke walked out to the middle, as they scored well together and put together a brisk partnership of 64 at a run rate if 8.72, before Clarke was unlucky to be caught out on 37. Knowing the end of the innings was quickly approaching, Warner and Michael Hussey added a quick-fire 33 run partnership at a run rate of 9.42. Warner, who was there from the beginning of the innings, celebrated his first ODI century with style, making 163 off only 157 deliveries, which included 13 boundaries and two huge sixes, until he was bowled on the last delivery of the innings. Warner’s inning saw him make the highest ODI score by an Australian batsman against Sri Lanka, as he took over Adam Gilchrist’s 154 in 1999. 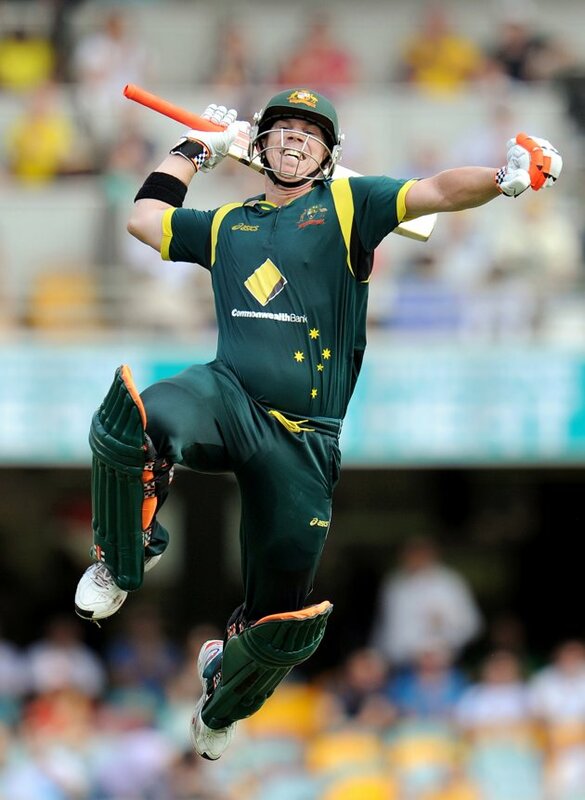 Furthermore, Warner had the highest individual score at the Brisbane Cricket Ground, beating the previous record, set by David Gower, who hit 158 in 1983. On top of that, Warner’s inning is now ranked the sixth highest ODI score by any Australian player. Thanks to Warner, Australia reached a mammoth total of 321, which is their sixth highest in a tournament final and also the fifth highest at a tournament final while playing on home turf. Not only that, but, this total is the second highest Australia have scored against Sri Lanka in a finals, behind the 368 they made at Sydney in 2006. Dhammika Prasad had two wickets for Sri Lanka, while four others, Lasith Malinga, Nuwan Kulasekara, Farveez Maharoof and Rangana Herath all had a wicket each in their attempt to try and limit the damage caused by Warner’s onslaught. Facing a challenging target of 322 to win, the Sri Lankans were slow to get out of the starting blocks due to the constant pressure kept on them by tight Australian bowling. Soon the pressure proved too much for the Sri Lankan batsmen to handle, as they started to topple one by one. When the sixth wicket fell on 144, it looked as if Australia had the game in the bag, but, that was when a shocking turn of events occurred, which no one was expecting to see. Nuwan Kulasekara and Upul Tharanga, upon taking the batting powerplay slowly started to claw Sri Lanka back into the game with their constant bombardment of boundaries and sixes. Kulasekara and Tharanga put together a record-breaking seventh wicket partnership against Australia of 104, which went at 9.04 runs an over. The previous best had been Roshan Mahanama and Upul Chandana’s 90 runs in 1999. The run rate for the century stand was Sri Lanka’s highest against Australia in ODIs and the third highest for the seventh wicket in ODI history. Kulesekara was then dismissed for 73 runs off 43 balls, after going for one big shot too many. Kulasekara, who thumped seven boundaries and three sixes, had a strike rate of 169.76, which is the highest over 50 runs score for a Sri Lanka batsman against Australia. Also it is the second-highest strike rate for a fifty-plus score in ODIs at Brisbane. Dhammika Prasad and Tharanga continued attacking the Australians to try and bring Sri Lanka as close to the target as possible. However, once Tharanga departed for a sensational 60 runs, Herath fell in no time as well, leaving Sri Lanka needing only 16 runs from the final over. But the fairy tale ending Sri Lanka looked to be aiming for was not to be as Malinga hit one straight to Michael Hussey, which ended the closely fought contest and left a dejected looking Prasad unbeaten on 31 from 21 balls at the non-strikers end. Sri Lanka’s last six batsmen put together 178 runs, which was a new record for the team, surpassing that of 176 against the West Indies in 1995 at Sharjah. Furthermore, Sri Lanka became the first team to score over 300 in their second innings at Brisbane. David Hussey made up for his poor batting performance by taking a surprising four wicket for 43 runs, which happened to be his second best bowling figures in his ODI career and the best figures by a spinner at Brisbane. Hussey was well supported by fellow bowlers, Brett Lee and Shane Watson, who both picked up three wickets each. Sri Lanka Captain, Mahela Jayawardene, was impressed with the effort from the lower order. “We’ve been playing some really good cricket, we fought till the end. It’s a good attitude to have. It was an incredible partnership. Kula did very well, lots of positives for us to take from this. When Upul got out, that probably put us back a bit. If there was a batsman left till the end, who knows? They took the momentum up front, that’s something we need to improve on. The guys are fighting for everything” he said. Captain Clarke, was a shell-shocked by the comeback that Sri Lanka made, but still credited his team on a job well done. “Warner and Wade were outstanding at the top. We got to the Adelaide Oval which will probably suit the Sri Lankans more than the Gabba. Watson saved us once again, we are glad to have him back in the team, this effort shows his class” he said. The two teams scores added together to make 627 runs, which, believe it or not, is the second highest in a final in Australia and also the sixth highest in ODIs played in Australia. With the first round going to Australia after a highly competitive and intense battle, the two teams will face off in round two, which Sri Lanka need to win to have any chance of still being in the running to be crowned champions. The teams will go head to head on the 6th of March at Adelaide. This entry was posted in Uncategorized and tagged Australia, Brett Lee, cricket, David Hussey, David Warner, Dhammika Prasad, Mahela Jayawardene, Matthew Wade, Michael Clarke, Nuwan Kulasekara, Shane Watson, Sri Lanka, Upul Tharanga. Bookmark the permalink.